Southern Home Inspections | Call us today! What are the Benefits of a Professional Home Inspection? It’s certainly possible to learn a great deal about a home during your first or second walkthrough—but without a highly trained eye, it’s easy to miss certain issues that could be detrimental to the quality of your prospective investment. That’s why at Southern Home Inspections, we offer a professional home inspection that will divulge every detail about a property’s condition. Closing on a home has its risks, but with the help of an experienced inspector, you can enjoy the peace of mind and confidence that comes as a result of comprehensive preparation. 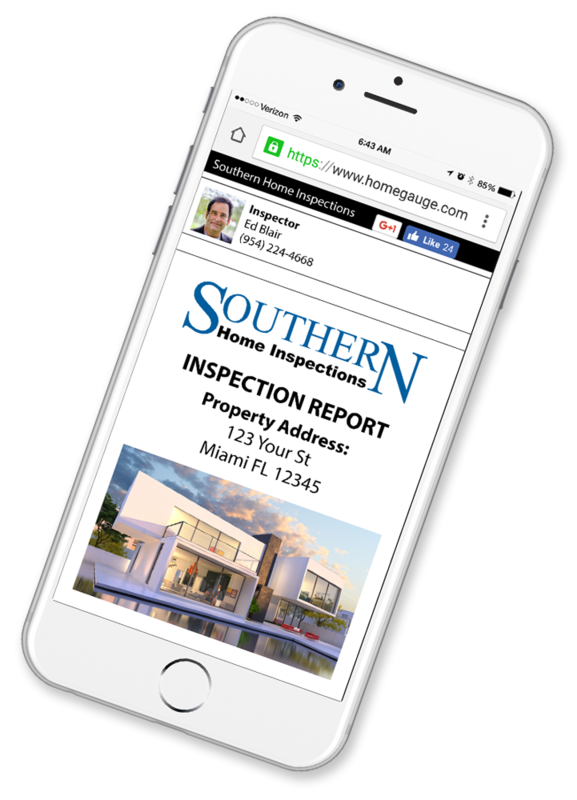 We offer comprehensive home inspection services to homebuyers and sellers in South Florida, including Miami-Dade, Broward, and Palm Beach counties. Our detailed reports are sent to your inbox within 24 hours of a completed home inspection. Your report will feature precise descriptions of each inspected component, thoroughly explaining any discovered issues and giving extra attention to areas of the home that you expressed particular concern about. We include numerous photographs throughout the report to complement your understanding of the home—and we also provide access to the cutting-edge Create Request List™ (CRL™) feature by HomeGauge. At Southern Home Inspections, we dispel the notion that the risks of homebuying can’t be easily and effectively managed. Our thorough home inspections will educate you on the condition of a home and ease your mind as you prepare to negotiate a purchase. Contact us today to request an inspection.